Last year’s winning design by Wilson High School student Marney Harris. Tenleytown is getting ready for the Yeti – and we want your help! Tenleytown Main Street invites high-school age youth in the community to submit design ideas for our 2018 Tenley WinterFest poster. Since 2012, a local student has designed the annual celebration poster that hangs in storefronts along Wisconsin Avenue. Your design could be the one featured for Tenley WinterFest 2018! We are now accepting entries for the 2018 poster contest. All high-school age students who live or attend school in the Tenleytown area are eligible to participate. Designs that meet the specifications listed below and are submitted by November 1st will be considered for selection. * The winning design will be printed and hung in businesses and other establishments in Tenleytown from November through early December. Who: All high-school age students who live or attend school in the Tenleytown area are welcome to submit a design. Eligible schools include (but are not limited to) Wilson High School, Georgetown Day School, and Sidwell Friends School. Students who attend other schools, but live in the neighborhood are eligible as well. 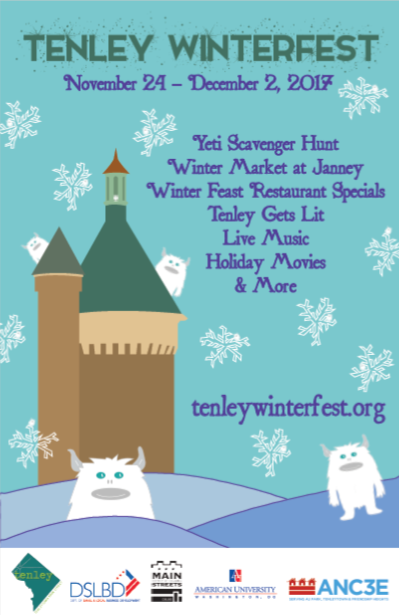 How: All designs must be submitted as digital files (.ai and .pdf) to tenleywinterfest@gmail.com. Include your name, address, phone number, and the name of the school you attend with your submission. Please review the design specifications (below) carefully before submitting your entry. Winners: Winners will receive one full-size printed poster, recognition on the Tenley WinterFest website and in social media and local news outlets where possible, and a gift certificate to a Tenleytown eatery. The Tenley Yeti graphic, available here or here, should be incorporated in your design. The yeti can be included in whole or in part, once or repeated, depending on what works best with your design. Designs should evoke a wintry theme and connect to Tenleytown in some way. Particular consideration will be given to designs that include a local/Tenley landmark or reference! No signatures should be included on the design (we will give credit to artists). The winning designer may be asked to make updates/edits to the poster before final printing, as determined by the Tenley WinterFest committee. The winning designer also authorizes the Tenley WinterFest committee to change or add to the information included on the poster at the committee’s discretion. *Tenleytown Main Street has final approval of all designs and reserves the right to solicit additional designs beyond the scope of this contest.